Photo by Kelley Balcomb-Bartok. 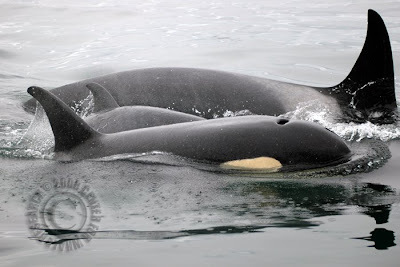 The new young calf surfaces between K14 (background, born 1977) and her second offspring K36 (foreground, born 2003). K14's oldest offspring, K26 (male, born 1993) was also playful and tactile with the new calf. Are Killer Whales true whales? Killer Whales are actually dolphins. Very, very large dolphins...but technically speaking, they are dolphins. The nomenclature can get confusing and may seem counter-intuitive, and like Alice in Wonderland's experience when she tumbled down the rabbit hole, you might get a little dizzy trying to sort it out. Biologists and taxonomists are meticulous and logical in the definitions, but most of us want simpler distinctions and to that end you might hear things like 'all dolphins are whales, but not all whales are dolphins' or 'anything over nine feet long is a whale'. Throw porpoises into the mix, and you'll hear that 'if it has a beak, it is a dolphin, if it doesn't it is a porpoise'-- except not all dolphins have "beaks". So where do the Killer Whales fit? Here is the simple answer: essentially, the Killer Whale has more in common with even the tiny Hector's Dolphin than it does with other whales such as the similarly sized Pygmy Right Whale. So they are considered dolphins - but because they are large cetaceans, we refer to them as whales. It has taken over thirty years of careful research to dispel the myths that surround these alarmingly named animals. Given the unfortunate and potentially frightening moniker of 'Killer Whale', they have had a lot to overcome in the public eye, and it helps that the research shows that they are intelligent animals that remain with their families for life. But that doesn't mean that Killer Whales are giant black and white versions of Flipper either. They are less friendly to us than Bottlenose Dolphins, and are unlikely to come to your aid if you are drowning (and if they did you would probably die of a heart attack instead of drowning! ), or to save you from sharks as other dolphin species are reputed to do. Even though the whales don't harm us intentionally, it is easy to get into trouble in the marine environment, and any animal will take measures to defend itself when it feels threatened. Just the backwash of their hasty retreat in trying to avoid us could send a diver tumbling. Our local Killer Whales deserve our respect, but not our fear or hatred. Call them what you will, they are remarkable and somewhat mysterious animals that increasingly require protection from us.